Since 2002, the Institute for Emerging Issues (IEI) has engaged North Carolina’s citizens, bringing people together to turn ideas into action. Experts at facilitating face-to-face communication, they wanted to extend their impact using digital tools. They envisioned an exhibit designed to educate North Carolinians about four of the state’s core concerns­–Education, Environments, Economy, and Health–and inspire and enable them to collaborate on these issues. 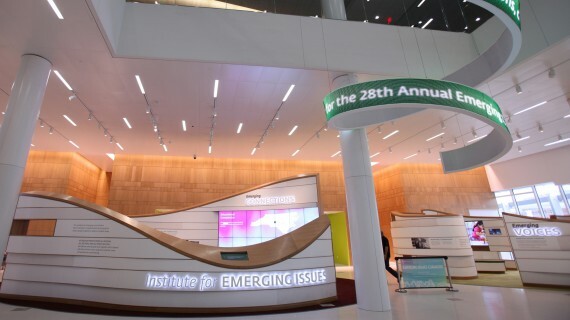 Working with IEI and our partners, we created the Emerging Issues Commons at North Carolina State University’s Hunt Library. A dynamic suite of interactives, the Commons took over two years to move through concepting, design, development, construction, and production. A custom-built software system connects the elements to each other and to a website and mobile application, extending the exhibit experience far beyond the library’s walls. From The Pulse, an 82-foot sculptural ribbon sharing tweets and statistics, to the Connections Wall, a 16’ set of screens that bring data to life, to the Ideas Tables, where up to 20 users can contribute their responses to the state’s challenges simultaneously, the Commons offers a variety of experiences and means of interaction. Housed in the state-of-the-art Hunt Library, the Commons had to complement its impressive surroundings by providing an eye-catching and compelling experience that encouraged users–generally students, campus visitors, and touring groups–to visit the space and explore the interactives. Like the library, the exhibit needed to push boundaries in terms of design and technology. To establish the optimal environment for civic engagement, we created components that work from afar to draw visitors in (e.g. The Pulse and Connections Wall), elements offering more of a “lean-in,” intimate experience (e.g. the Ideas Tables and Voices Alcoves), and different zones that accommodate varying use cases and individual vs group experiences while also appearing visually cohesive. The end result provides visitors with the opportunity to educate themselves on North Carolina’s issues and collaborate with others on potential solutions. With civic engagement as The Emerging Issues Commons’ primary goal, we focused on designing experiences to inspire and enable participation in public policy. 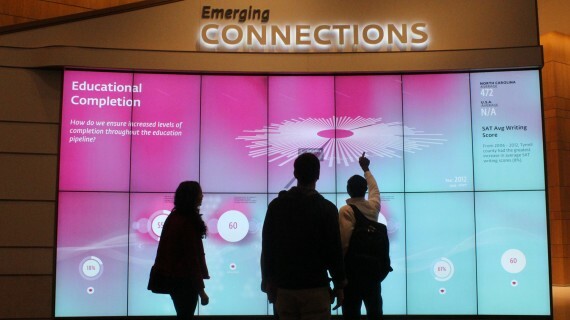 The interactives capture visitors’ attention and hold it, reaching them in both the head and the heart. Data is visually represented in a clear, creative way. Personal stories of average North Carolinians are shared, connecting Commons visitors emotionally to the community at large. Opportunities to propose solutions to the state’s issues are offered, encouraging visitors to translate the knowledge the Commons affords them into action. The representation of each of the Commons’ areas online broadens the exhibit experience by allowing a larger audience to get involved in learning about and working to resolve the issues facing North Carolina. News and social media are integrated directly on the homepage so the content stays fresh. Relevant “Challenges” faced by the state are presented in a dynamic way where user-responses are immediately polled. North Carolina has a history of transformative ideas, and the website provides a platform for citizens to voice their thoughts, for peers to rate them with personal feedback, and for users the world over to learn from the progressive action happening in the state. The Commons’ design aesthetic was inspired by North Carolina’s diverse population, landscape, industry, and culture. Bright, bold colors combine and transform to express shifting viewpoints on public policy issues. Simple yet playful animation brings the content to life, making typically heavy material feel approachable and engaging. The Institute for Emerging Issues and its approach to its work are imprinted on the Commons both on the surface and behind the scenes. IEI fosters civic engagement by providing individuals with the resources to better their communities, a mission reflected in the meta-narrative informing the interactives’ structure: elements enter into a system, elements react with one another and undergo change, elements exit the system with increased energy and a new purpose. In a similar way, the back-end build of the Commons’ interactive components reflects IEI’s mission by uniting disparate elements to achieve a better result. A custom-built server stores user- and IEI-generated data that web services make available to both the physical interactives and a website and mobile application, resulting in a seamless delivery of content both on- and off-site. The Commons experience thus extends beyond the library’s walls, bringing together users inside and outside the space to tackle the state’s challenges.